In a small saucepan, bring stout and molasses to a slight simmer and stir just to combine the two. Let cool. In a medium bowl, whisk together flour, baking soda, baking powder, cinnamon, ginger, and nutmeg. In a large bowl, whisk together eggs, oil, brown sugar, sugar, and vanilla. Once stout mixture is cool, stir into eggs and sugar. Then stir in flour mixture. Try not to over-mix. Butter and flour a bundt pan and pour cake batter into pan. Bake cake at 350°F for 45-50 minutes until a tester comes out clean. When cake is done, immediately poke a bunch of holes in the cake while it's still warm. Pour honey over the cake and smooth the honey out with a spoon so it gets absorbed in the holes. Let cake sit for 30 minutes. Then remove from pan and let cool. Sprinkle with powdered sugar and serve! There are some beautiful cakes out there in the world. Some have wonderful colors and frostings and intricate designs. These are all fine and good, but there’s another type of cake out there that I think I need to bring to your attention: The ugly duckling cake. It’s not that this gooey honey cake is actually ugly, but it just isn’t flashy. This is the kind of cake sits on a table at a party, untouched, for an hour or so until somebody breaks off a piece of it. Then, like wildfire, word spreads and the thing will be gone! This cake has a lot of dark and delicious flavors going on, but what really sets it apart is the gooey honey that you pour over it after baking it. That just takes it to another level. 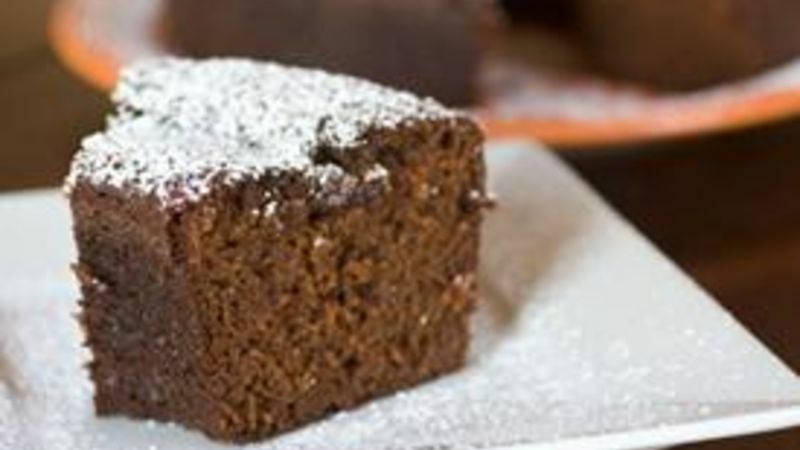 To start this cake, you need to combine stout beer and molasses. The best way to do this is to heat them up in a small pan until they are combined. Molasses is pretty thick and the heat will make it easier to mix. In a small bowl, also mix together all your dry ingredients except the sugars. If you can, I recommend using fresh ground nutmeg. It really adds great flavor. Next, in a large bowl, whisk together the sugars, eggs, oil, and vanilla extract. This is sort of the base for the cake batter. Once those things are whisked together nicely, stir in the stout/molasses mixture. Make sure it’s cooled down before adding it or you might cook your eggs! Then just mix in your dry ingredients and stir everything until the flour is mixed in. Try not to over-mix this. It’ll be a pretty wet batter. One of the most important parts of this recipe is how you handle the pan. Be sure to butter it well and then dust it with some flour. If you don’t do this, your cake will stick badly to the pan. Non-stick spray doesn’t work. You need butter and flour to prevent this cake from sticking! Then just pour your batter into your dish and you’re ready to go! Bake this guy at 350 degrees for about 45-50 minutes until a cake tester comes out cleanly. It should be a pretty dark finished cake. Now for the fun part. While the cake is still hot, quickly poke a bunch of holes around the entire cake. Don’t poke all the way through the cake, but go pretty deep. I used a chopstick to poke my holes, but you could use a knife or anything really. Then just pour over a good amount of honey right over the cake. It’s important to do this while the cake is hot because that will make the honey more liquid and easily absorbed by the cake. Use a spoon to kind of spread the honey out over the cake and then let it sit for about 30 minutes so the honey gets completely absorbed. When you pour the honey, you’ll have pools of it sitting on the cake, but after 30 minutes, it’ll be completely gone. Then you can take your cake out of the pan! It’s kind of tough to see the ribbons of honey that flow through this cake, but trust me… you can taste them! This was one of the best cakes that I’ve made in a very long time. It may not be the flashiest cake in the world, but the flavors will win you over. Nick kind of wanted to pour a tiny amount of brandy over this cake also. He didn’t do it though because he was worried about awesome overload. Be sure to check out his blog, Macheesmo, and follow him on his Tablespoon profile.